20 December 2016, at 6:00a.m. Litter management has a huge impact on poultry health and comfort. Glenneis Kriel asked Jan Grobbelaar, an independent poultry consultant, for advice on how producers can make the most of poultry bedding. Poultry litter can either be a farmer’s best friend or worst enemy. When managed properly, it will help to prevent diseases and boost farm income by creating a favourable production environment. When managed poorly, it will not only have a negative impact on animal health, welfare and carcass quality, but also on the feed conversion ratio and growth of birds. Making the most of poultry litter starts with choosing the right kind of bedding material. According to Jan Grobbelaar, training director at Dumela Poultry Solutions in Pretoria, South Africa, bedding material should be light, so that it is easy to manage. It should also be suited for use in compost or animal feed, so that it can be easily be disposed of after use. For health reasons, however, opt for a material that’s soft and compressible, with a medium particle size. But there are also problems associated with materials that have particle sizes smaller than 2mm – such as sawdust, fine-ground or finely chopped wheat, straw or hay – or that might produce dust, such as wood bark. As Grobbelaar explains, poultry dust – airborne particles of feed and bedding mixed with organic matter from droppings, feathers and dead skin – can affect bird and human health, because, aside from poultry waste, it contains bacteria, viruses and fragments of fungi and spores. “In the past, it was thought that poultry dust did not have a negative impact on human health, but today we know that it causes respiratory problems in birds and humans,” he says, adding that the material used as litter, the age of the litter and climatic conditions all exert an influence on dust levels in a grower house. Another essential quality for material used as bedding is that it should be highly absorbent and quick to dry, to reduce contact between birds and manure. Grobbelaar says pine shavings are still the most popular bedding material in South Africa. Peanut and sunflower hulls are also good, but they have to be turned every week or two to prevent them from caking and to maintain friable conditions. “Fungi that could be damaging to broiler health, will develop if sunflower or peanut hulls become wet,” explains Grobbelaar. Paper and sawdust are not ideal when it comes to moisture absorption, according to Grobbelaar, since paper tends to harden when it gets wet. Sawdust absorbs moisture, but takes too long to release it again – resulting in the litter becoming very wet. Excess moisture in bedding material is a real problem as it will increase the incidence of breast blisters, skin burns, bruising, condemnations and downgrades. It will also promote bacterial and fungal growth and can cause excessive ammonia emissions. Grobbelaar points out that ammonia levels of about 25 parts per million (ppm) have been associated with poor growth rates, birds’ increased susceptibility to Newcastle disease and a build-up of E. coli. Prolonged exposure to ammonia levels of 50 to 100 ppm has also been found to cause keratoconjunctivitis and blindness. When it comes to the detection of ammonia levels, Grobbelaar said that levels of 10 to 15 ppm can usually be detected by smell. 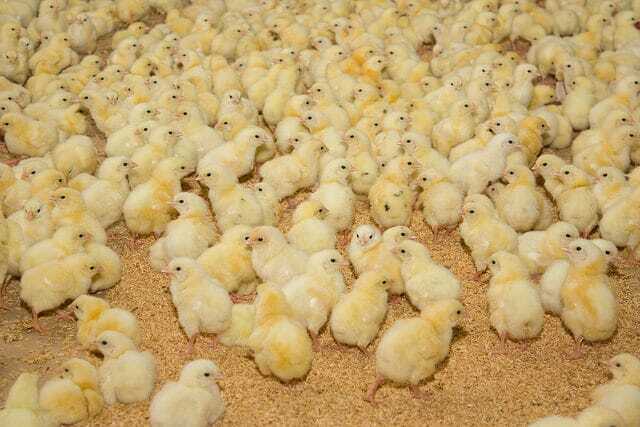 At 25 to 35 ppm it will burn your eyes; at 50 ppm, it could result in broilers exhibiting watery and inflamed eyes, and at 75 ppm, broilers will start showing discomfort and might start jerking their heads. New bedding material should be stored properly before it is spread in the broiler house, to avoid wet-litter problems. Broiler houses should be managed properly in terms of humidity, ventilation and stocking density and the bedding should be between 70mm and 100mm deep, depending on the type of material used and conditions in the broiler house. Birds should also receive a high-quality diet to prevent a built up of high moisture levels. Grobbelaar explains that certain dietary ingredients, especially salts, and some drugs cause birds to drink and excrete large amounts of water, which exacerbates wet-litter conditions. In South Africa bedding is renewed after every production cycle. In addition, the ideal bedding material will have low thermal conductivity to retain warmth and act as insulation – it should help to protect broilers from the cold floor. Grobbelaar says this is one of the reasons he does not like sand that much: it has poor thermal conductivity and therefore stays cold. Birds might also struggle to move in sand, if it is spread too deeply. Finally, your chosen bedding should be free from harmful toxins and contaminants. Grobbelaar says it is best for growers to avoid hardwoods, for example, as these might contain fungi that could be harmful to the broilers.